Lock in a great price for Chalet RoyAlp Hôtel & Spa – rated 9 by recent guests! Beautiful hotel in magnificent surrounding! Great service. Delicious various breakfast. Fire place at the spa, just by swimming pool made my day ! Beautyfull and cozy chalet (The gray cushion covers are not my style though). The Bed was reeeally comfortable. Nice atmospheric Spa (1 Pool, 1 Sauna, 1 Hammam and a lot of buyable massages etc.) Some reviewers complained about the Staff, but according to our stay, I can't disagree more. I guess I never encountered more adorable Staff in a Hotel. The driver of the shuttle was amazing, did over and above the call of duty. Its a shame the rest of the staff weren't even 10% as good. Fabulous. We have been a few times. They asked if you want the beds changed. I do. It wasn’t. I had to get the maid back as she clearly thought she could get away without doing it. I am very environmentally conscious in my living but this one thing I am willing to pay for. Lack of water. I travel a lot. Nearly all 5 star hotels I stay in give water in the room everyday. One wouldn’t notice the cost of it if you put it on the bill. The ambiance is exceptional - cosy and welcoming, interior design is fantastic. Great for children of all ages. Location and view are stunning. Staff was very friendly. Très belle chambre Executive (spacieuse, propre, belle déco) Excellent petit-déjeuner, énormément de choix, jus d'orange frais Le Spa Privé, quelle merveille ! A faire absolument en amoureux ! Chalet RoyAlp Hôtel & Spa This rating is a reflection of how the property compares to the industry standard when it comes to price, facilities and services available. It's based on a self-evaluation by the property. Use this rating to help choose your stay! One of our top picks in Villars-sur-Ollon.The 5-star Chalet RoyAlp Hôtel & Spa offers direct access to the ski slopes in winter and to the Villars Golf Club in summer. You can ski right to and from the front door. There are 2 restaurants and an exclusive spa area. An indoor swimming pool with open fireplace, a hot tub, a sauna, a steam room, a fitness center and relaxation area invite you to relax. As a member of Leading Hotels of the World, Le Chalet RoyAlp Hôtel & Spa combines the charm of a mountain lodge with the elegance of a modern luxury hotel. All rooms are individually furnished in alpine style and have a private bathroom with bathrobes and toiletries. The Jardin des Alpes Restaurant offers an inviting atmosphere for both adults and children. The chef honors French gastronomy by offering dishes made from farm-fresh products. His creations combine modernity and respect for the ingredients. In the BeAr's Bar you can enjoy snacks and the mountain-view terrace. Open during the winter season, traditional Swiss specialties are served at the Grizzly restaurant which is styled like an Alpine chalet. Additionally, the table d’hôtes adjacent to the main kitchen is the place to go for a made-to-order meal in the company of the chefs. During summer, the Free Access Card is included in the rate and consists of many free activities in Villars. This property is also rated for the best value in Villars-sur-Ollon! Guests are getting more for their money when compared to other properties in this city. 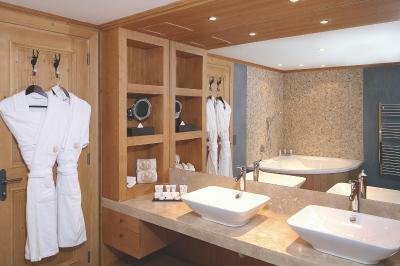 When would you like to stay at Chalet RoyAlp Hôtel & Spa? Spacious room has park views from the private balcony. Please note that neither extra beds nor cribs are available in this room type. Public parking is available on site (reservation is not needed) and costs CHF 12 per day. Private parking is available on site (reservation is not needed) and costs CHF 24 per day. Spacious room with mountain or glacier views. Please note that an extra bed or crib is available in this room type. Spacious suite with park views. One extra bed or crib is available in this room type upon request. Spacious suite with mountain or glacier views, and a private balcony. One extra bed or crib for children is available in this room category upon request. Spacious room offering park views (no terrace). Please note that neither extra beds nor baby cots are available in this room type. House Rules Chalet RoyAlp Hôtel & Spa takes special requests – add in the next step! Chalet RoyAlp Hôtel &amp; Spa accepts these cards and reserves the right to temporarily hold an amount prior to arrival. Chalet RoyAlp Hôtel & Spa accepts these cards and reserves the right to temporarily hold an amount prior to arrival. Please note that children under 2 years of age are not allowed in the spa area. Please note that extra beds are only available for children up to age of 16, not for adults. Please note that guests who depart before their booked stay is complete will still be required to pay for the full booking. This is the only hotel that I know that charges 10% extra for your ski pass. The hotel should also not charge for parking. As stated by others before in the reviews, the food and drinks are ridiculously overpriced. In the non-gourmé restaurant. Some of the food was excellent (Hummus, Sea bream, Duck, rather on the small side though and the side dishes cost (a lot) extra) some other rather flavourless which is a no-go for these prices (e.g. the bowl of rice for 12 CHF or the salad as a starter for around 25CHF (which was really big tough)). A 4cl Glass of Johnny Walker black label for 22CHF is more than a bad joke, since a whole bottle costs around 35CHF. In the Bar the alcoholic drinks range from 20-30 CHF, we had just one who was excellent though. Since the Hotel is not on a mountain Top and easily acessible by road, there is no reason for such high prices. As whole, the temperature in the hotel was on the cold side (water in the pool was also a little cold). Also, was there on my birthday, and receptionist just wished me a Happy Birthday (a candle for the room / piece of cake, or a flower would have gone a long way to personalize a 1-night stay for a total of CHF 430, but no gesture of the kind...). They should not charge for parking! Room was quite small with no view. They should not charge for parking. Food was not anywhere near 5 star. The food was tepid when it came to the table at dinner. The hotel didn't seem bothered. The choice of hot food at breakfast was limited. The hotel charged 4CHF for a coffee capsule - in the room! Front desk staff.... My 72 year old mum was with me, she fell ill, I asked 3 times for a hot compress for her, to no avail, after being reassured they will sort one out from a member of staff on the front desk at 1730, by 2100 I gave up but it was too late to go to the pharmacy. On the first night, my 3 year old son was extremely hungry so I ordered a Pizza assuming it would take 10-15 mins, 25 mins later I received a cremated pizza. I asked the concierge for tickets for the train to Bretaye, instead she sold me ski passes, what should have cost approx. chf100, she charged me chf200... all in all completely offended that they didn't look after my mum. Breakfast room felt crowded on Sunday morning and was not perfectly organised. Restaurants have not the same perfection as the rest of the hotel - but all in all, a place to return to. Great spa, nice facilities and fabulous room.